This week is women's health week and Learn Vest has 7 great healthy and finacially wise tips! In case you didn't know - Learn Vest is a great finacial tool that offers tips and tools to help women become more finacially savvy. 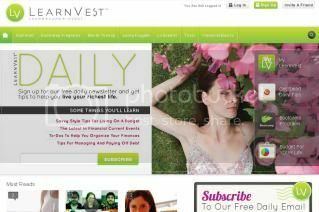 The tag line "Learn Earn Invest" is exactly what they do. I'm trying really hard to do #7 on the list: Wear Sunscreen. I recently bought a tinted moisturizer with SPF 50 in it which is really helping. Check out the tips and sign up for Learn Vest if you haven't and are interested in getting better about money management.